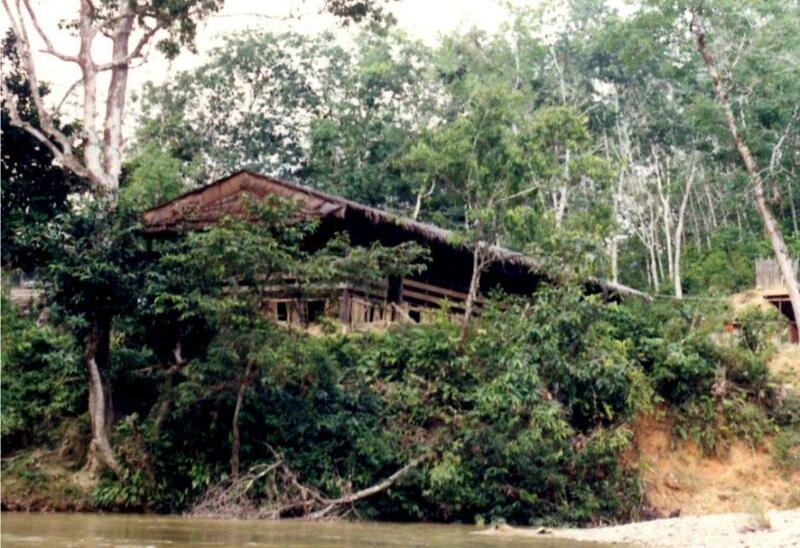 A longhouse beside the river. Seventy three percent of Kalimantan (formerly known as Borneo), the largest island in the Indonesian archipelago, is Indonesian territory. The rest, in the north is East Malaysia, made up of the Malaysian states of Sabah and Sarawak and the off-shore islands of the Federal State of Labuan. The independent state of Brunei also is on the north coast. 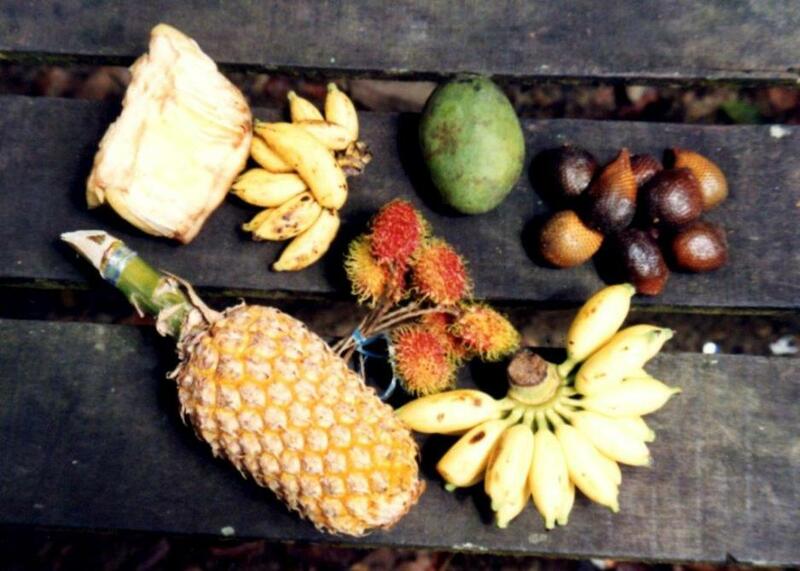 East Malaysia is mostly lowland rain forest with areas of mountain rain forest and is a wonderland of animals and plants, rewarding to those willing to walk into the jungle. Right: In the Sarawak rainforest. In Sabah in 1990 my wife and I visited the Kinabalu National Park a World Heritage Site, the Sepilok Orang Utan Sanctuary and Sandakan, the site of the notorious Japanese Prisoner of War Camp which was the starting point for the forced death marches to Ranau. We undertook a two day walk into the Niah National Park in Sarawak to see the Niah caves, an important prehistorical site where human remains dating back 40,000 years have been found. The caves are an important nesting place for the swiftlets which supply the vital ingredient for bird’s nest soup. The nest collectors carrying small oil lamps make a hazardous climb up towering bamboo structures wedged against the cave roof into the darkness. They break off the nests which are collected by men on the floor of the cave. Returning to Kuching we decided to see the way of life of the Iban, one of many groups of Dayak people. We made a four hour drive of 230 klms from Kuching followed by an hour long trip in a native canoe upstream against the rapids on the Lemanak River to reach an Iban longhouse. Bringing our gear up from the canoe. 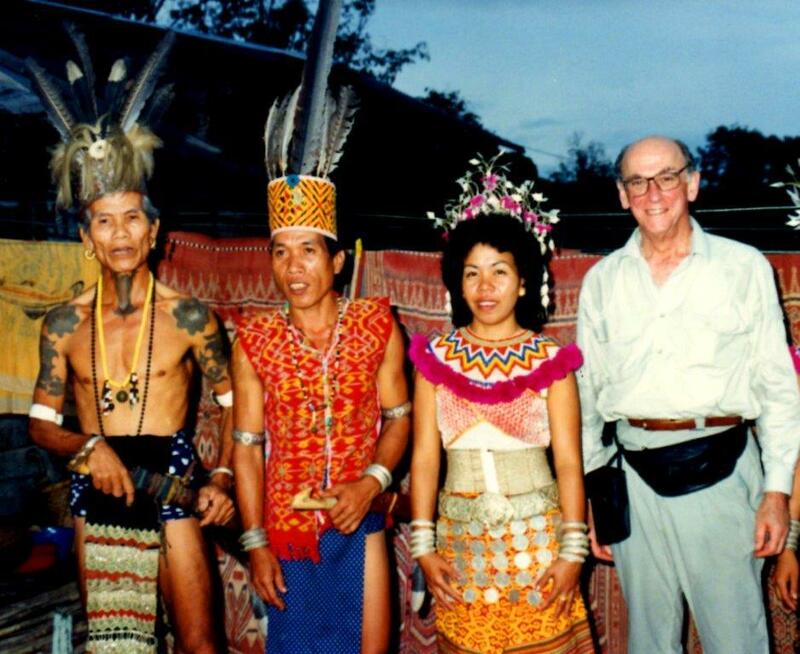 Dayak (Dyak) is a loose term for over 200 ethnic subgroups each with its dialect, customs, laws and culture. They are the earliest inhabitants of Borneo. 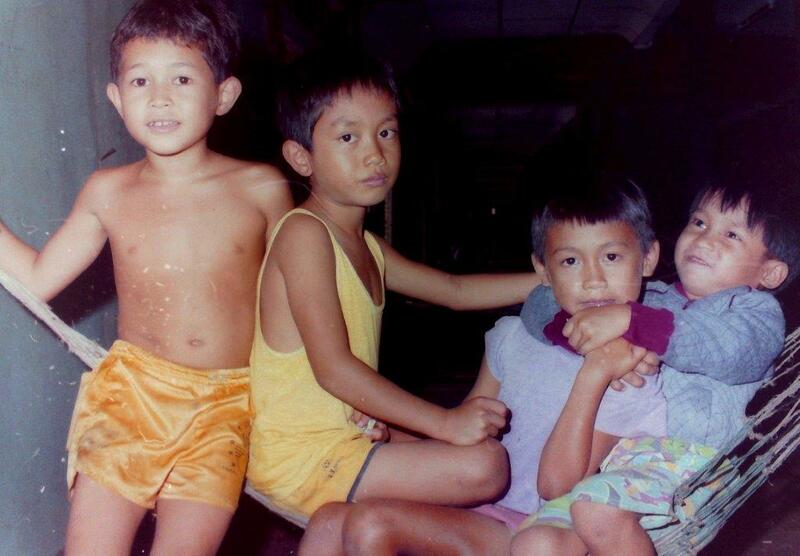 The Ibans, most of whom are in Sarawak, are a branch of the Dyaks. During the British colonial period they were known as “Sea Dyaks” and were renowned for headhunting. Their reputation was fearsome as a strong and successful warring tribe. When headhunting was banned by colonial legislation the practice appeared to disappear. It resurfaced during World War II when the Allied Powers encouraged the practice against occupying Japanese. It surged again in the late 1960’s against Chinese suspected of being Communists and in the late 1990’s when settlers were brought in by Government from other areas. The Iban traditionally live in buildings known as longhouses which are raised above the ground on stilts. Typically a long wall runs approximately down the longitudinal axis of the building with the space on one side of the wall effectively an access corridor. On the other side of the wall are the bilik, the private areas for living and sleeping, with a door for each unit. The bilik are separated from each other by walls. To avoid the risk of cooking fires spreading to the living spaces kitchens are built separately, sometimes in another building reached by bridges. The chicken and pigs are kept under the longhouse. 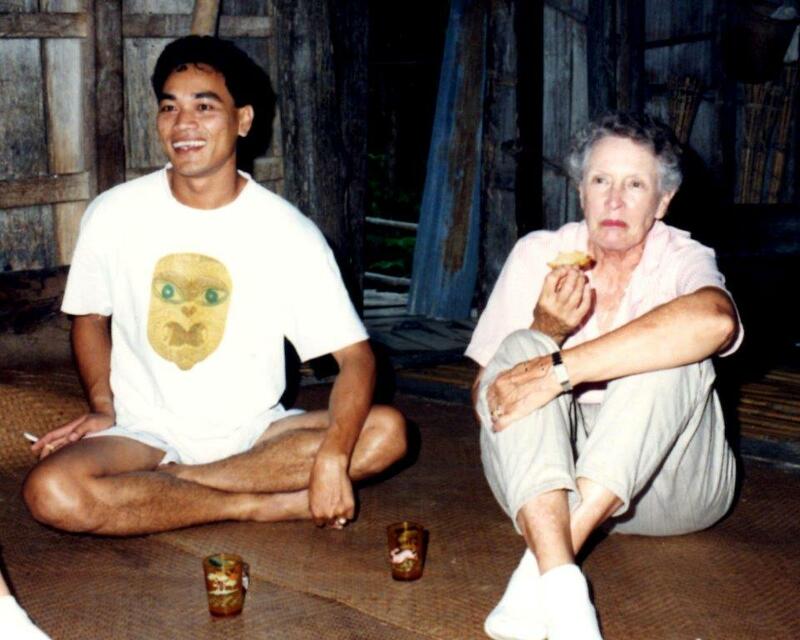 On arrival, as guests, we were entertained in the public area of the longhouse where we were served the traditional welcoming drink, tuak– an alcoholic drink – made from cooked glutinous rice mixed with homemade yeast for fermentation. In the evening the chief and members of his family demonstrated traditional ceremonies and dances before our evening meal which we ate sitting on the floor with the family. We slept in a separate longhouse provided for guests and were woken as the sun rose by the crowing of roosters, and chicken digging and pigs snorting under our floor. Pam and our guide Chai. The chief and two other men in traditional dress. Girl dancing. Copyright George Repin 2014. All Rights Reserved.